For car, home, and on the go! Perfect for use anywhere baby is! 100% wireless option with rechargeable batteries. Last 3-4 Hours on single charge. Its hard to resist the urge to sneak a peek at the back seat when youre driving: Is your baby sleepy? Restless? Just what is that child up to? This dashboard monitor puts your mind at ease. The camera is concealed inside a plush toy that straps securely around a seat and gives your baby something pleasant to focus on. Meanwhile, it zaps a wireless image to a monitor up front. The pictures crystal clear, day and night. It runs up to six hours on batteries, or you can plug it into your cars cigarette lighter or wall sockets for recharging. The Always in View video baby monitor is truly the most portable video baby monitor on the market that can be used at home, in the car, and on the go. 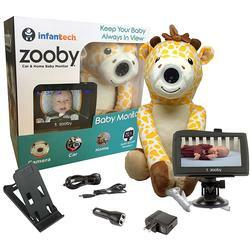 The monitors camera is embedded in a specially designed plush that gives this monitor its unique portability because it can be placed anywhere at home, and also allows for easy placement in a car. A parent can view a rear facing infant and even a forward facing toddler as they are driving. This 4.3" monitor has a split screen function which allows parents to view multiple children at the same time. * The monitor is 100% wireless, includes night vision, rechargeable batteries, and all accessories necessary to use anywhere. Perfect for all parents that want a monitor that does it all, and brings them peace of mind, security, and confidence. The most portable monitor to date. Feel secure by having the Always in View baby monitor with you wherever you go. Keep baby rear facing longer. Always In View minimizes your need to turn around.